Boil the eggs – about eight minutes for duck, five for hen’s. Cool as quickly as possible under cold water or even better, iced. Get the grill hot and cook the bacon until it’s crisp, about five minutes, turning it over half way through. Chop it up and set aside. Whisk up the dressing ingredients with seasoning. Crush the toasted hazelnuts, add to the bacon and pop them into a warm oven. Cook the asparagus in a pan of boiling, salted water until tender, about five minutes. 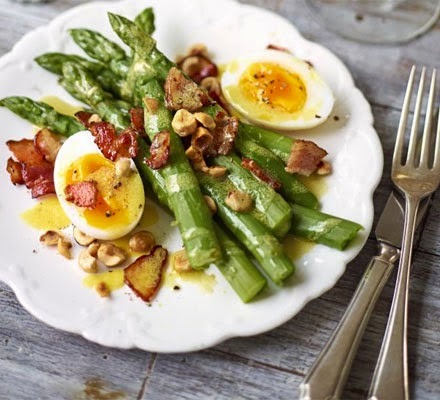 Halve the eggs and divide all between plates, sprinkled with the bacon and nuts and drizzle on the dressing.